We explore the first complete set of Westermann lithographs to come to market in over three decades. Primarily known as a sculptor, H.C. Westermann has garnered a growing cult following in recent years. The expert craftsman and war veteran is currently the subject of a major retrospective, Volver a Casa (Goin' Home) at the Museo Reina Sofia in Madrid. 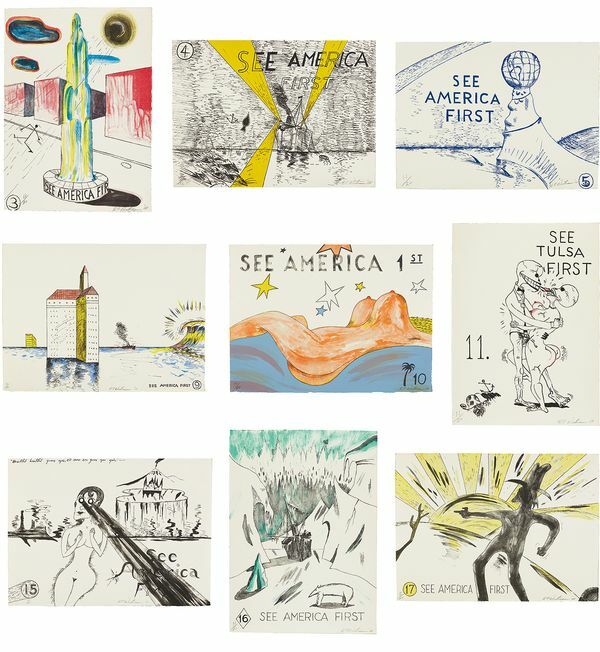 When his set of 17 lithographs SEE AMERICA FIRST comes to auction on 23 April in New York, it will be the first time in over 30 years that a complete Westermann set has come on the market. In the 1960s, the phrase was emblazoned seemingly everywhere: As SEE AMERICA FIRST featured prominently in advertisements for railways, national parks and bus lines, it also seeped into America's shifting collective consciousness. Prior to accepting a coveted invitation to print at the Tamarind Lithography Workshop in Hollywood, Westermann took a long road trip. After his transcontinental trek to California, he wrote about "A NEW RESPECT AND LOVE FOR THIS COUNTRY AFTER TAKING A TRIP ACROSS IT SLOW!/ A Tribute to America/ IT'S BEAUTIFUL." 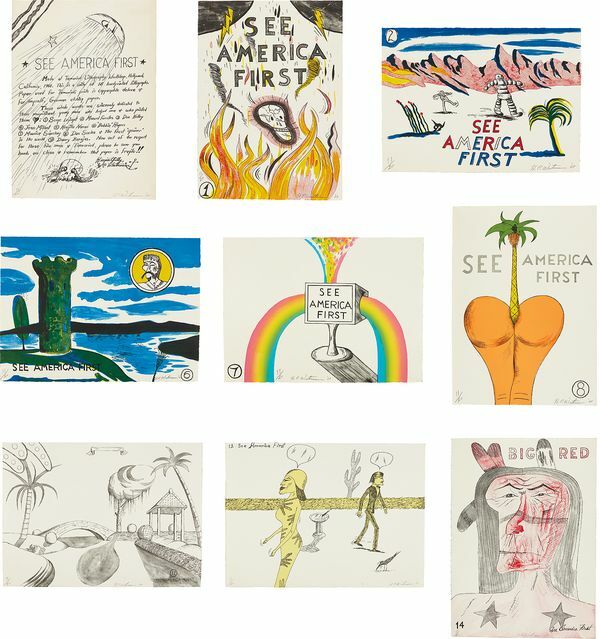 Several preparatory travel sketches and watercolors preceded SEE AMERICA FIRST, Westermann's expansive and tightly choreographed portfolio that served as both a love letter to America and warning against encroaching environmental degradation. In the portfolio's fifth plate, where a globe hovers above a scorched landscape with sharks encircling, Westermann captured the nascent energy of environmentalism during the 1960s. The teetering globe evoked the insignia from the 1964 New York World's Fair while announcing Westermann's protective impulse amidst a moment of global optimism. In plate 9, seas engulf one of Los Angeles' tallest towers, perhaps drawn from tidal waves that actually hit California while the artist and his wife visited. The bubbling stream in plate 12 that twists along banks dotted with palm trees provides respite from the portfolio's more daunting images, in the manner of this picturesque Victorian landscape. Yet, above floats a blank banner: an epitaph to the illustrious pre-industrial landscapes that Westermann traversed en route to California. 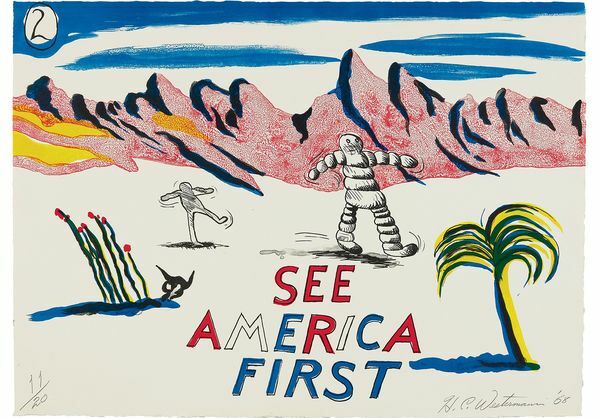 SEE AMERICA FIRST reveals Westermann's protective perspective. He was a naval gunner in the Pacific theater at the end of World War II and never shook the vulnerability and responsibility that he felt during attacks by kamikaze. Large ships were frequent subjects for his sculptures that also feature in plates 4 and 16 of the portfolio. Humor is the life raft that Westermann lobs to his viewers, which made otherwise alarming images agreeable. In the colophon Westermann dutifully remarked on all of his printer collaborators, writing "These...works are sincerely dedicated to the magnificent young men who helped me + printed them <3..." and "Now out of due respect for these fine men, + Tamarind please be sure your hands are clean + remember that paper is fragile!!" Before departing the Tamarind printshop Westermann left each of his collaborating printmakers a cash gift and hosted a thank you party. Unsurprisingly, Westermann rejected the canvas-covered portfolio covers that the Tamarind workshop provided to encase the portfolio. 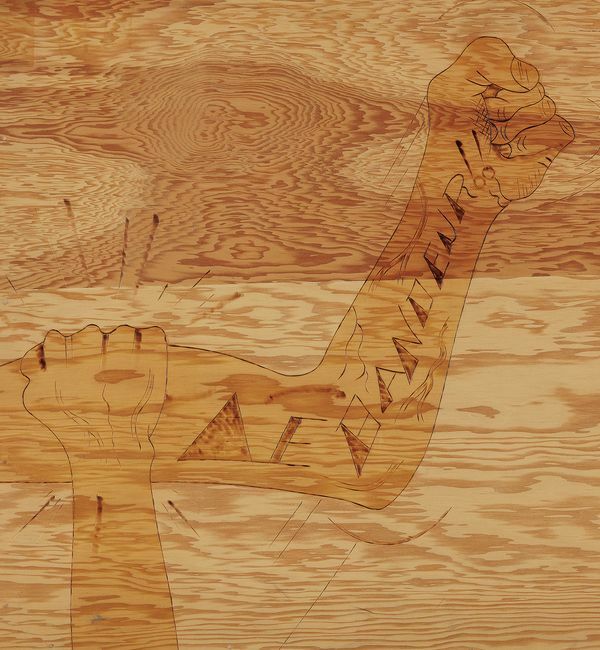 He opted instead to construct, by hand, his own durable wood boxes together with his uncle, a highly-skilled wood carver, that were covered with a shellacked, wood-burn drawing of "Le Bandeur" or "the shaft," the daily salute that he exchanged with his printers. Westermann observed that these wooden sculptures would "protect them [the prints] + keep the suites intact." This original box will accompany the 17 works once purchased at auction. 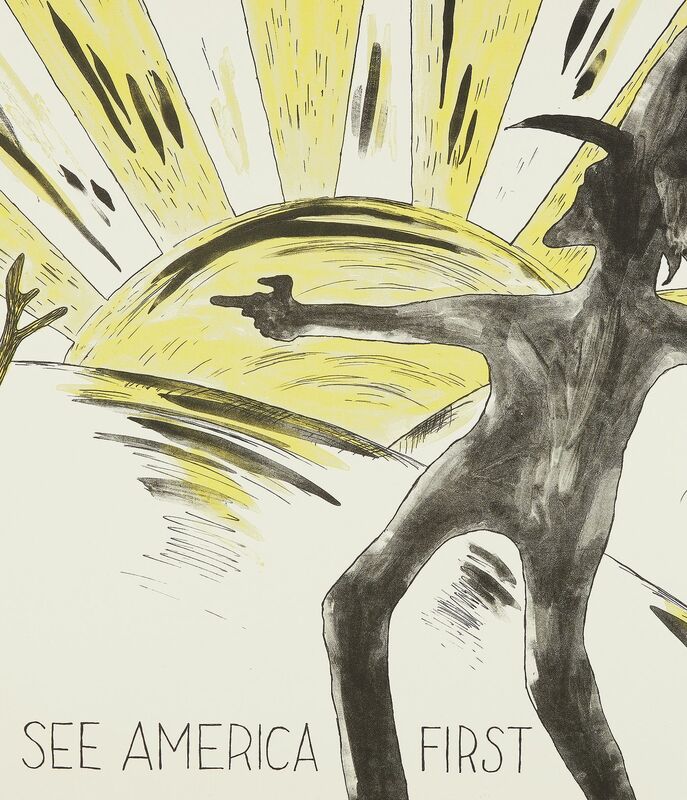 Both emblematic of their time and oddly prescient, this portfolio of lithographs can be viewed as Westermann's attempt to protect America and the world.